Most parents say they would like their children to be kind, thoughtful, generous adults. But it can be hard to know how to teach and model these traits. I was recently challenged to perform a “random act of kindness” with my family by Produce for Kids. They provided me with this list of 100 ideas to get our creative juices flowing. After some compromise (another ability many of us parents prize! 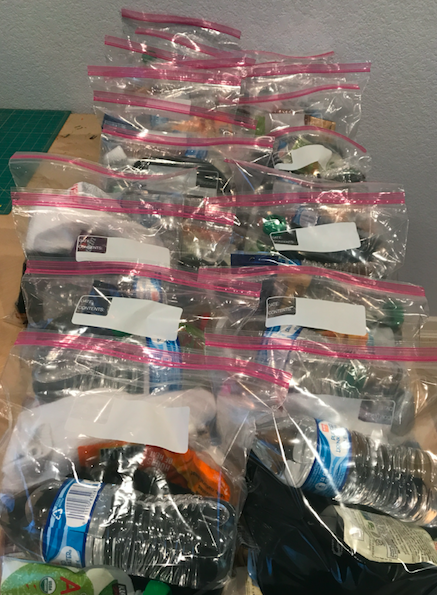 ), my 3 kids and I decided to make “homeless bags.” There are about a million ideas online for how to put together these little care packages for people experiencing homelessness. And it’s actually something my kids had done a few times before with other organizations. But they had always wanted to host their own bag making event. So we decided to go for it. On Thanksgiving. When we were hosting dinner for 20. How did I get talked into that? Anyway. What we did was text our Thanksgiving guests and asked them to bring something to contribute to the bags. 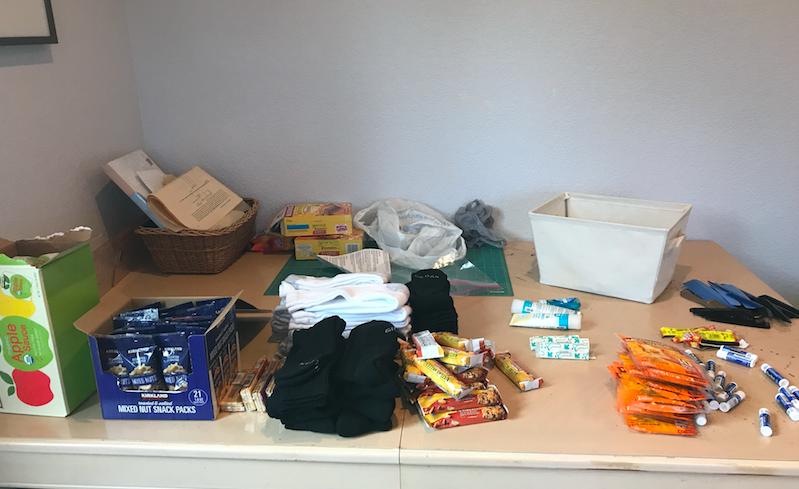 We ended up assigning people various items like toothpaste, combs, water, snacks – so that we didn’t have duplicates. 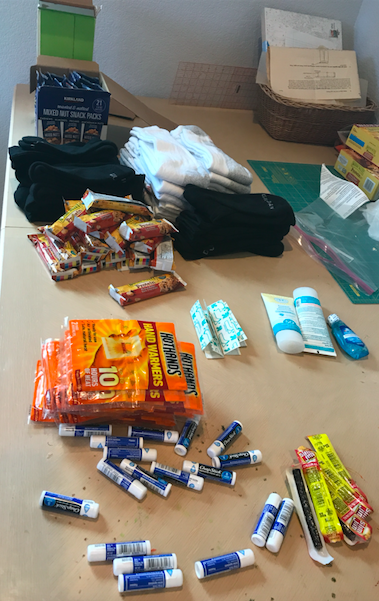 We provided gallon-size zip top bags, a whole bunch of travel-sized lotion, lip balm, and sunscreen. 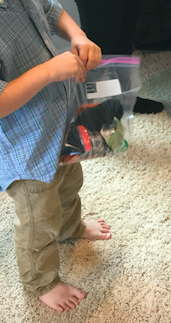 The last bag had been completed and was being zipped up! I missed the whole thing! The good news is: this activity is easy, fast and suitable for people of all ages (we had folks from 1 to 71 participating!). The bad news is: if you blink, you’ll miss the whole darn thing! At the end of the day, it was a fun activity that will allow us to provide just a bit of comfort to those experiencing homeless in our community. Everybody got to take home a couple of bags (along with a few slices of pie!). 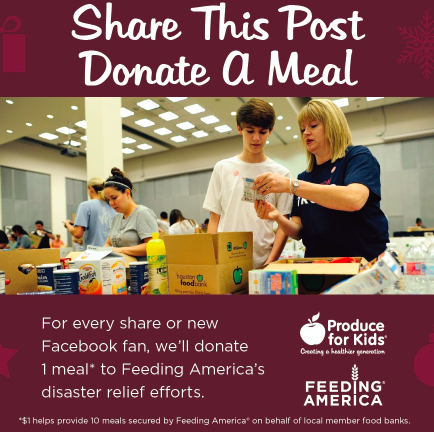 Log into Facebook and check out what Produce for Kids and Feeding America are doing to help recent disaster relief efforts! And once you do that, take a break this holiday season and spend some time with your family – maybe snacking on these little cuties? 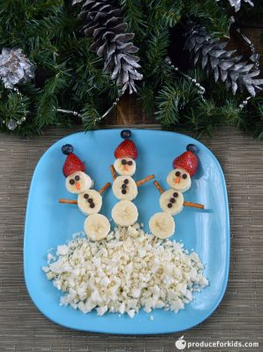 Check out the full recipe for these yummy Snowman Fruit Kebobs at Produce for Kids.